Henry J. Willms: farmer, writer, and churchman; born 12 June 1882 in Petershagen, Molotchna Mennonite Settlement, South Russia to Jacob and Maria (Walde) Willms. He was the sixth of thirteen children. 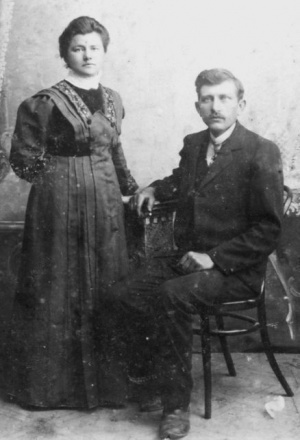 On 21 October 1905 he married Susanna Neufeld. They had seven children: Jacob, Henry, Margaret, Susanna, Mary, Kathleen, and John. Henry completed high school in Halbstadt, Molotchna and was baptized in the local Mennonite Church. He owned a farm in Tiege. During World War I he worked in the Russian forestry service (Forsteidienst). Owing to the turmoil caused by the Russian Revolution, two of his brothers immigrated to Canada in 1925. However, Henry felt compelled to remain in Soviet Russia to help build the country under a socialistic government. In 1921, Lenin had persuaded the 10th Party Congress to approve the New Economic Policy. These initiatives seemed to promise improvement for ordinary people. Then in 1928 Joseph Stalin introduced his Five Year Plan, emphasizing the development of heavy industry as a means of rebuilding the war-shattered Russian economy. Henry notes in his diary that as a result of the havoc caused by these measures, the Willms family fled to Moscow. They attribute their departure from the Soviet Union in 1929 and eventual immigration to Canada as God’s providence. Along with five other families, the Willms family settled in Abbotsford in 1931. With the influx of numerous other Mennonite settlers, Henry became active in developing the social life of the community. Soon after arriving in Abbotsford, Henry joined the South Abbotsford Mennonite Brethren Church, and served as secretary-treasurer of the church for many years. Henry was a visionary. He encouraged Mennonite settlers to start a co-op grocery store, a local co-op fire insurance plan, a bulldozer co-op for clearing stumps from the land, and a co-op berry processing plant – the Abbotsford Growers Co-op. Henry also took great interest in the development of a German-language Bible school (South Abbotsford Mennonite Brethren Bible School, the predecessor of the present Columbia Bible College). During World War II Mennonites, being primarily German-speaking people, feared that they might lose their possessions and be evicted from the coast as had happened to people of Japanese ancestry. These war-induced tensions notwithstanding, Henry J. Willms was part of a committee that petitioned the provincial government for permission to start a Mennonite high school in Abbotsford. With official permission to do so, the Mennonitische Erziehungs Institute was begun in 1943, and soon became the Mennonite Educational Institute. Willms was also keenly interested in local evangelism, resulting in the establishment of the “Rand Mission”, a mission organization whose goal it was to evangelize the areas surrounding Clearbrook and Abbotsford. This mission became the predecessor to the West Coast Children’s Mission, which eventually became the British Columbia Mennonite Brethren Board of Church Extension. Henry J. Willms farmed to pay his bills. However, he found community work and writing more to his liking than farming. He died in Abbotsford on 31 July 1965. Willms, H. J. Die Sued-Abbotsford Ansiedlung, ein Historischer Bericht Vor den Toren Moscau. Abbotsford, BC: South Abbotsford Mennonite Brethren Church, 195?. Willms, Henry J. Personal Papers, including Mein Lebenslauf, a One Year Diary – 1909, and a Two Year Diary – 1928-1930. Willms, John. "Willms, Henry J. (1882-1965)." Global Anabaptist Mennonite Encyclopedia Online. April 2010. Web. 21 Apr 2019. http://gameo.org/index.php?title=Willms,_Henry_J._(1882-1965)&oldid=139688. Willms, John. (April 2010). Willms, Henry J. (1882-1965). Global Anabaptist Mennonite Encyclopedia Online. Retrieved 21 April 2019, from http://gameo.org/index.php?title=Willms,_Henry_J._(1882-1965)&oldid=139688. This page was last modified on 31 October 2016, at 17:15.